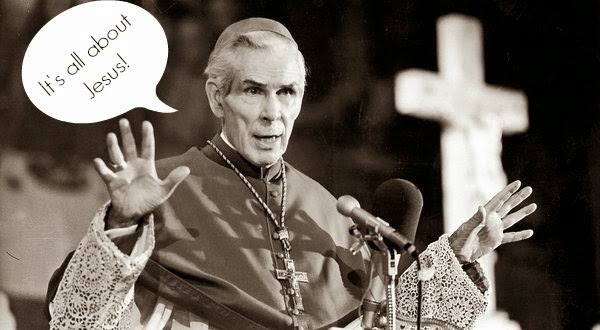 We are sad, angry, and - quite frankly - scandalized to learn that the Sheen Foundation has no other choice but to shut down Fulton Sheen's cause for beatification and canonization. At this point in the cause it is the canonical norm that the Sheen Foundation would examine Sheen's body and acquire first class relics for the faithful to reverence, et cetera, because we're Catholic and that's what we do. The Archdiocese of New York has refused to allow the Sheen Foundation to do so, despite the fact that even the Vatican has expected it of them, despite the fact that they had previously assured the Sheen Foundation and Bishop Jenky that they would. We had every reason to hope that James' alleged miracle of being brought back to life and full health after being dead for over an hour would soon be approved by the Congregation for the Causes of Saints and then the Holy Father, thus allowing for Sheen's beatification to occur. We feel very strongly that James' story and the life and writings of Fulton Sheen contain an awesome potential to change hearts, bring souls to Christ, and glorify Almighty God. It is a shame that this good work has been brought to a standstill by the Archdiocese of New York. To read the official press release from the Diocese of Peoria, Bishop Jenky, and the Sheen Foundation please go to the Sheen Foundation's website. I know that it seems like this cannot be true. I know that it seems like the Diocese of Peoria has got to have gotten its story wrong, is making a mountain out of a molehill, is creating scandal. Sadly, I know that is not the case. I am not a representative of the Diocese of Peoria nor the Sheen Foundation, and I know I have been spared many of the details, but because of our connection with the cause I know that these are facts. And finally, I want to address Cardinal Dolan. Cardinal Dolan, my husband and I have long been fans of yours - even since your days in Wisconsin. Because of how much we have loved, supported, and prayed for you we feel especially hurt. Your Eminence, years ago your diocese turned down the opportunity to put forth and promote this cause. The Diocese of Peoria has invested years of time, manpower, and money. Please cooperate with the Sheen Foundation and Diocese of Peoria, and let us re-open the cause! I promise you that if you do (and Sheen is beatified in Peoria) you can have dinner in our home. My husband will grill you a fabulous steak and I will bake you some of my amazing chocolate chip cookies. Here's some articles from around the web. Catholic News Agency spoke with the Roman postulator, Dr. Ambrosi..
Brandon Vogt has an anonymous source. The Archdiocese of New York released a statement saying they await direction from Rome. The original press release from Bishop Jenky and the Catholic Diocese of Peoria. Aleteia has an article expressing how everyone's feeling: baffled. National Catholic Register reads my blog. More from the National Catholic Register. The Eye of the Tiber takes their satirical spin on it, and it's really funny to boot! *Catholic Answers has got all the Catholic answers regarding relics. Begin at 6 minutes 50 seconds. Will write letters tomorrow morning! I don't know a lot about the process of beatification and canonization but why does the body need to be exhumed for the pope to sign a piece of paper approving the miracle and the beatification?? Yes, relics are great, but I find it much more important to recognize this man as a miracle worker and beatified. I just don't get it. We are extremely disappointed. Yes, that's a good question. I'm not a canon lawyer obviously but I do now that it is the canonical norm (read: this is how it's done) that they examine the body. Is it incorrupt? Does it smell like roses? So on. It is also the canonical norm that we have first class relics at the beatification Mass. We have no first class relics from Fulton Sheen so we would have to exhume the body in order to have those. Wow. We'll write and pray. Archbishop Sheen, pray for us. God's Will be done. I'm so confused! Will write and call!!!!! Goodness. Commence letter-writing. Archbishop Fulton Sheen, pray for us! What about Fr Andrew Apostli CFR? He is in New York and the vice postulator. There is something missing from this story. Do you think there could be a good and sound reason the AoNY wants to hold on to the body? yes, this all just seems so very strange. prayers for all involved. Right I am disappointed in the response as well. Both online and here. Telling them what to do is not being a good Catholic. They know and have far better experience and wisdom. Yes please write with your tone as I'm sure it will further the cause immensely NOT! Sorry, Mary, I didn't see your question until the ever gracious Kaylee brought it to my attention. Thanks, Kaylee! I don't know why they want to hold on to the body. I know that the Vatican expects them to allow the CDoP to exhume it and get first class relics. I know that that multiple family members of Fulton Sheen's support this cause and want to see the next step happen so his cause can advance. I know that when they passed on the chance to sponsor the cause they effectively agreed that the CDoP would be allowed access to the body and relics. I do not know why Dolan and his chancellory are not working together to get done what Cardinal Dolan said he'd do. Maybe they have a great reason, but if they had a great reason then the Vatican would not have its expectations and Bishop Jenky would have released a different statement. I don't want to think anything badly of Cardinal Dolan either and I'm still trying to give him the benefit of the doubt. That's why I was asking him questions instead of accusing him. I am waiting for his response and I really want to know his answers. It's really so awful, for so many reasons. It's hard not to think badly of a Cardinal I enjoy so much when something like this happens. My husband and I were talking about it last night. Get it together Bishops! I'll be praying with you for a swift end to what seems like, on the surface, a really petty move by the AoNY. How do you just say "no" to the pope? I teach Spanish, going to offer this to my kids: what should they be saying to the Pope? I'm going to go and seek through the sites for guidance. Love that I can use what I teach to do this! You can keep it short. Have the kids tell the pope about themselves, that they heard that Sheen's cause was closed, and that they hope there's something he can do to reopen it. If they know about Sheen maybe they can mention what they love about him, or if they know about my son's alleged miracle and they believe it's true they could mention that. THANK YOU! Fantastic! We are on it!!! Hi Bonnie: Thanks for writing this. I am totally confused on why this situation occurred. Karen and I had the opportunity to work with you a few years ago on the (then) alleged miracle regarding James Fulton. Ironically, Archbishop Dolan will be in Des Moines in just 3 weeks speaking at the Christ Our Life conference. Hope some people bend his ear. In the meantime, I will blog on the subject and spread the word. There has to be more to this that we don't know right? I find it hard to believe that Cardinal Dolan would be against furthering Sheen's cause. I mean something must've happened that we don't know? I don't know...just so so disappointing. God's Will be done. Perhaps the time is not right yet. Perhaps it is not God's Will? I don't know, but in humility, it might be best to wait. I grew up with Fulton J. Sheen on the new TV in our house. He was very popular. There is no doubt that he was very holy. There should be no scandal associated with his cause. If it were me, I'd wait to see what will happen. God can do anything. There may be reasons that you do not know. Pray. If it is God's will, he will be named a saint. If he is in heaven, he is a saint. You are right - it is all in God's hands. You can wait. I will pray and promote. I would love to write a letter, but I am (like you) a busy mom and not full of great, convincing words (at this time). Do you have some "talking points" that would be good to include? That would help me! Yes. I'll add it to the post above. Thanks for asking. I am so disappointed that Fulton Sheen's cause for canonization has been stopped, Bonnie. It just doesn't make any sense. I pray and ask for his intercession all the time. I love his books and used to watch reruns of his show. This was a holy man! (And O BOY can America and the world ever use his example of holiness right now!) I can't imagine how sad you must feel since you and your family are so intimately involved with his canonization process. I will join you and the others here in writing letters and will pray as well. Bonnie, Can someone create a form letter that can be printed, signed, and sent? Or a form email that we can click on and send to the Archdiocese of NY or the Vatican? I am happy yo write a letter of support, but so many don't have the time or feel confident enough doing so. I am just thinking about the form letters/emails you see and have the opportunity to send to your state legislators, etc on specific issues. Could this be a way to get more of a mass response? Just brainstorming here. Will write and pray, Bonnie. Thanks for bringing to our attention. I just read New York's response. How terribly heartbreaking and wrong their choices seem to be :( I'm so sorry blogging friend. This is all pure nonsense and you are deceived! The Bible says we are not to think about men above that which is written in Scripture (1 Cor 4:6) and thus the whole beatification process is a sham and a hoax since the Lord does not say one blessed word about it, but rather, calls ALL believers "saints". Thus, to support any process of "boosting" some dead person up into some higher "category" of saintliness, is downright heretical whether you like it or not. You even condemn your own modus operandi by admitting that you prayed to Sheen BEFORE it was even thought to canonize him; so if praying to saints is legit (and I say it is NOT) what good is there to "OFFICIALLY" allow the laity to pray to dead people by a fancy televised ceremony in Rome wherein God ends up getting less prayers and the dead saint ends up getting more? The plain simple fact of the matter is that we are instructed to "CAST ALL YOUR CARE ON HIM, FOR HE CARETH FOR YOU" (1 Peter 5:7, Phil 4:6-7). And you wonder why there are so many negative comments? I'll tell you why: It's because in practice, you reject the word of God, that's why! So don't flatter yourself. Your child's recovery is due to the fact that he was not actually dead to begin with. God will not have anything to do with a miracle when that person is in rebellion against his word. And no, in case you were wondering, I'm not Catholic. I left that madness 25 years ago and have not looked back since.....(except when I come across blogs like yours). I was confirmed by Bishop Sheen at St. Louis Church in Pittsford, NY in 1968 while he was Bishop of Rochester. Since then I have always asked for intercession and kept the cause of his canonization in my prayers. I don't know if this counts as a miracle but two prayers have been answered regarding my son. I don't understand the church or political issues involved here but I know these things can take time, so I will continue in my prayers.